A common rule for Windows users is to install and use only one antivirus software solution at a time. Most developers ask the computer user to uninstall other security software before the new software can be installed. It is however possible to install different types of security software that can be run next to each other, for instance an antivirus software, an anti-malware software and a rootkit scanner. Some antivirus programs make use of multiple scanning engines to increase the detection rate. Antivirus-Multi offers a way out, at least for a specific directory that it monitors constantly for file additions and changes. The idea behind Antivirus-Multi is to make use of command line antivirus scanners to protect a working directory. This can for instance be a download directory, P2P folder or a shared folder in a computer network. Configuration of the application is unfortunately not that easy. It is up to the user to locate the command line antivirus scanners and integrate them with the correct parameters into the software. The developer could add to the usability of the software by making this configuration step easier by linking to the downloads of the scanners and providing example parameters that most users might find sufficient to use. The configuration is divided into three steps. The user first needs to select a working directory. This directory will be monitored by Antivirus Multi. Any file addition will be send to all scanners that are configured in the application. Step 2 is the most important step, the addition and configuration of the antivirus scanners. The user can add pre and post commands as well as the local path to the scanner. 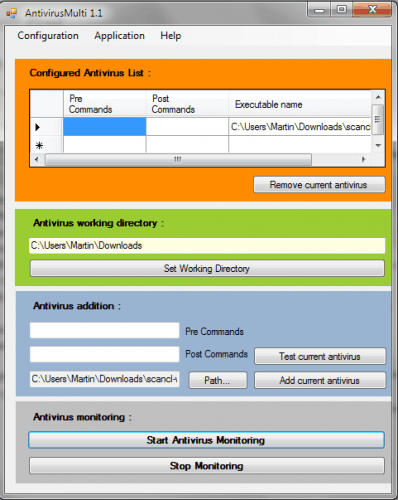 A click on Start Antivirus Monitoring will start the monitoring of the selected folder. There is no visual indicating that the program is running, another thing that the developer needs to work on. Moving a test file into the monitored folder was the easiest way of finding out if it is working. Antivirus Multi offers an interesting concept. The configuration will surely turn away most users who cry out loud whenever the command line is involved. Advanced users on the other hand might have been looking for a program like Antivirus Multi. Antivirus Multi requires the Microsoft .net Framework 3.5. It can be downloaded from the Google Code Project website. I hope which someone have other suggestion ….